Nadal vs Fognini 5.0 at the China Open: Can Fognini do a US Open repeat? But the elation will not last long as he will have to channel his energy towards winning his tricky last-four encounter against his newfound rival Fabio Fognini. Prior to the start of this year, the two had met only four times on the tour, with all the meetings coming over the preceding two years. Their Beijing rendezvous included, they will now have met more times this year alone than their previous ones put together. An intriguing fact revealed by their head to head record is that the feisty Italian has now won three of the four matches played this year. By thwarting off Nadal’s challenge so frequently, he has managed to posit himself as a major threat to the Mallorcan. It all began at the Rio Open this year. The semifinal meeting between the two lasted over two hours. At the end of three gruelling sets, Fognini emerged victorious with a scoreline of 1-6 6-2 7-5. It was a shocking result as Nadal was playing on his best surface, at a tournament where he was the defending champion and against a relatively unheralded player. Though he had not had good runs since the beginning of the year, there was hope among his fans that clay courts would bring out better performances from the Spaniard. It also turned out to be Nadal’s first loss at a semifinal stage of a clay court tournament in over 12 years. At the Barcelona ATP 500 event, Nadal once again lost his match against the Italian, this time in the round of 16. With the 6-4 7-6(6) win, Fognini became just the second man after Novak Djokovic to defeat the King of clay twice on the surface in a single year. After his match Nadal attributed his loss to poor play on his part. With this win, Fognini secured himself a spot in the record books of tennis. Prior to the US Open swing, Nadal made an unusual stop at the German Open being held at Hamburg. This time, he managed to notch a win against the Italian. A 7-5 7-5 win in two and a half hours in the finals gave Nadal his third title of the year. It looked like Nadal and finally solved his Italian puzzle, but Fognini just refused to end rivalry. 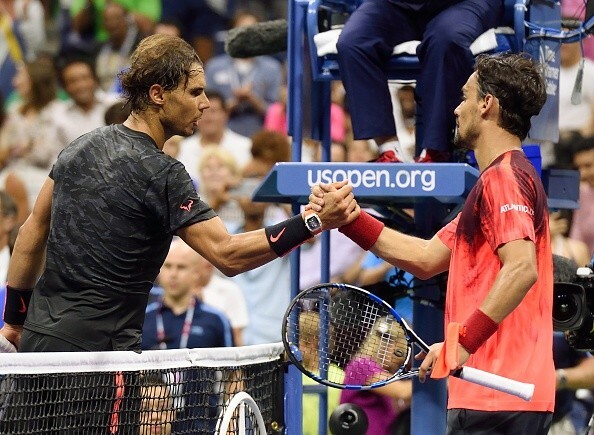 At the US Open, Nadal once again faced the challenge of playing Fognini, this time in the third round. Having taken a two sets to love lead, Nadal looked to be in the driver’s seat. But in the sets that followed, Fognini gave it his all and snached the match from Nadal. At the end of the match, Fognini rightly signalled that it was a mental victory and Nadal conceded the Italian had played well to earn the win. It is not just his repeated losses to Fognini but Nadal’s overall results that have prompted the debate on whether he has to look for a ‘supercoach’ and leave Uncle Toni behind. In fact, even Toni Nadal said recently that another coach could join the team if Nadal’s results continued to peter down. Some of the facts quoted could be surprising, but when viewed in the background of the stellar career Nadal has had so far on clay courts, creating records with every victory, there is bound to be a low every time he loses a match. Yet a win on Saturday will definitely earn him a mental boost at a time when his career is seemingly plummeting towards its nadir. Saturday’s meeting between the two will definitely be an interesting one for tennis fans, given the rivalry that they have built up this year, with many betting on Fabio Fognini to beat Rafael Nadal once again. (Interestingly, Nadal won their previous meeting at Beijing in 2013 in three sets). From the way his previous rounds have progressed,the possibility of a victory doesn't look definite for Nadal. Even if he wins this match, Fognini could end up losing his next (against Novak Djokovic or David Ferrer), keeping in line with the matches that he played against David Ferrer, Pablo Andujar and Feliciano Lopez following his previous victories over the former world no.1. Yet, even a title victory might not give him as much satisfaction as being able to tame Nadal once again.